Have you ever been in the situation where you have a great looking WordPress theme, but you are missing some custom styling for different elements? Styles with Shortcodes is the solution for this problem. This plugin lets you customize content faster and easier than ever before by using Shortcodes. Choose from 100 built in Shortcodes like; jQuery Accordion, Tabs and Toogle, Tooltips, Column Shortcodes, Gallery and Image Shortcodes, Button Styles, Alert Box Styles, Pullquotes, Blockquotes, Twitter buttons, Retweet button, Facebook Like, Follow me on Twitter buttons, Linkedin, Google +1, Flattr and many more! You could also use the plugin for your clients website and then have them purchase additional shortcodes. The possibilities are endless! Downloadable Content (Only users with valid License Key). Download Bundles with additional Shortcodes and free Add-ons. 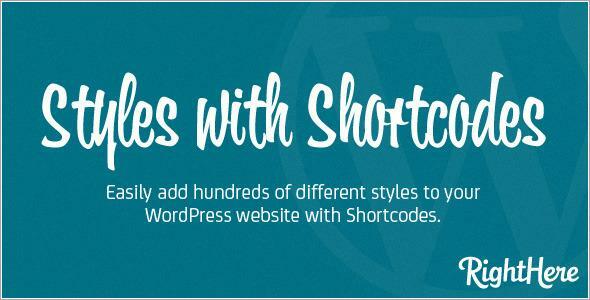 Share the post "Styles with Shortcodes for WordPress"